NASA recently sent into space organisms that might sound like they came from space to begin with—microbes that can essentially breathe electricity. Shewanella oneidensis bacteria, discovered in 1988, were the first microbes known to be able to breathe by transferring an electric charge to a metal outside their cell membrane. NASA recently sent a batch of Shewanella to the ISS to see how they react to the spacecraft environment, as they could be useful for life-support systems. In fact, all metabolism is powered mainly by electron transfer. Animals must breathe oxygen because, in their aerobic metabolism, electrons are picked off of molecules within the cell and go through a long chain reaction ending at the inhaled oxygen molecules, which take on the electrons and share them with hydrogen atoms to produce water. In most bacteria capable of anaerobic respiration, sulfate or nitrate might take the place of oxygen as the final electron acceptor. But the Shewanella oneidensis bacteria that traveled to the space station for study last February can, in the absence of oxygen, use a metal outside the cell as the final electron acceptor, transferring a charge. Since Shewanella was discovered in 1988, scientists have found a host of similar microbes, known as exoelectrogens, that can “exhale” or “inhale” electrons or in some cases do both. NASA, always looking to maximize efficiency, has taken an interest. There are a number of potential applications, though none has yet been made practical for space travel. One idea, says John Hogan, a scientist in the Bioengineering Branch at Ames Research Center who is overseeing the space station experiment, is to make fuel cells or electrolysis cells that would use genetically engineered varieties of these strange microbes as catalysts on their electrodes. These fuel cells could be used to process wastewater while generating energy and converting the waste into various products, from edible biomass to pharmaceuticals to bioplastics. In 2006, graduate students at the Massachusetts Institute of Technology founded IntAct Labs, now known as Cambrian Innovation, with funding from a NASA Innovative Advanced Concepts (NIAC) grant to study “bioelectric space exploration.” Among the ideas the company explored under the grant was a microbial fuel cell based on exoelectrogenic microbes and powered by wastewater. What came next were grants from the U.S. Department of Agriculture, the Environmental Protection Agency, the National Science Foundation, the Army, NASA, and others, mostly aimed at further developing the use of electrochemically active bacteria for wastewater treatment and power generation. 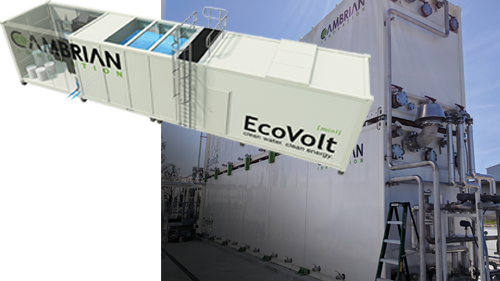 Units of Cambrian Innovation’s bioelectrically enhanced wastewater treatment system, the EcoVolt Reactor, can be stacked to meet a larger facility’s needs. For businesses generating 10,000 to 15,000 gallons of waste per day, the EcoVolt MINI (inset) combines the EcoVolt Reactor, which removes most contaminants, with its more conventional EcoVolt MBR (Membrane Bioreactor), which polishes the water for reuse. But NASA was interested in using the microbes to create more than just energy. In 2011, Hogan oversaw a Small Business Innovation Research (SBIR) contract with Cambrian to fund the development a life-support system that would use exoelectrogenic microbes to extract carbon dioxide from the air in a spacecraft and generate oxygen, water, and methane. While NASA didn’t plan to make direct use of the methane, its production was considered a possible future commercial application. The idea would prove to be prescient. The year before Cambrian undertook the Ames work, it had worked on another SBIR contract with Johnson Space Center to build a reactor to treat wastewater while functioning as either a microbial fuel cell, converting wastewater to energy, or a microbial electrolysis cell, using input electricity to break down waste and create useful hydrogen or methane. “We knew we could generate methane but thought it might be interesting to do all three—energy, hydrogen, and methane. And what if we could switch between them?” says Silver. That project resulted in a patent. It also resulted in a working cell and test data. “Across the board, we gained experience iterating on materials and inoculation methods,” says Justin Buck, Cambrian cofounder and chief technology officer. He adds that the work validated that the basic concepts worked, as well as the benefits and efficiency of the technology and the conditions in which the microbes best performed. Silver notes that NASA was skittish about the idea of relying on colonies of living organisms for life support, but the work showed that the biofilms the bacteria formed on the electrodes were reliable. 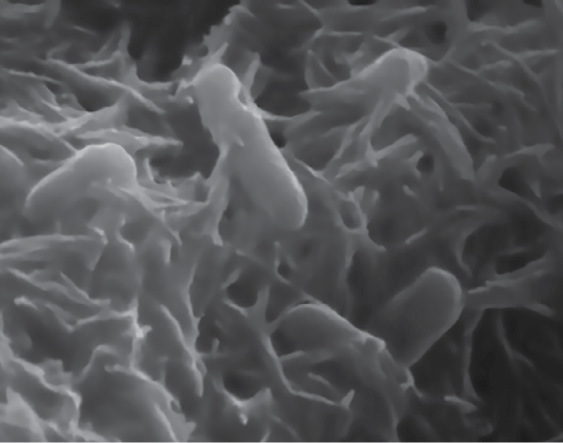 “It validated that the biofilms are extraordinarily tough and resilient,” he says, noting that this robustness and consistency is now a major advantage of the company’s commercial product over alternatives. In the fall of 2013, Cambrian announced that its bioelectrically enhanced wastewater treatment system, the EcoVolt Reactor, was available for sale. By then it had successfully field-tested one of its shipping container-sized units at a California winery over 18 months. The prefabricated, modular system applies a small electrical charge to enable what Silver calls “biologically assisted electrolysis.” Microbes on the anode break down waste to generate electricity, while different microbes on the cathode—electromethanogens—feed on that electricity, as well as carbon dioxide, to create methane-rich natural gas to be burned for power. The gas provides significantly more energy than the charge that’s put into the unit, making it a net-positive energy generator. Wineries and breweries were the first industrial facilities the company targeted for adoption of its technology because they produce large amounts of highly contaminated wastewater—around five gallons of wastewater for every gallon of wine or beer produced. That wastewater is also far more concentrated than what households produce and what municipal treatment facilities are designed to treat, averaging about 30 times more concentrated than domestic waste and forcing beverage producers to come up with their own solutions or face steep fees. Low-tech aerobic treatment options, such as wastewater treatment ponds, require a huge footprint, while more advanced aerobic options produce large amounts of solid waste and use a lot of energy. Traditional anaerobic alternatives generate renewable energy and produce less solid waste but are sensitive to fluctuations in input and other environmental changes and tend to require careful oversight and management. With the help of its living electrodes, the EcoVolt Reactor can reliably process more variable loads of wastewater than other anaerobic systems with minimal oversight, all while achieving high treatment and methane production rates, the company says. The natural gas it produces is 70 to 80 percent methane, which he says is higher than alternatives can produce. Because the system is prefabricated, he adds, it can be transported by road and is easy to set up, and if a facility expands its operations, it can scale up treatment by adding another unit. For every gallon of wine it produces, a winery creates about five gallons of wastewater that’s 30 times more concentrated than household wastewater. Breweries generate similar levels of waste. This makes them a natural market for Cambrian’s bioelectrically enhanced wastewater treatment systems, although the company is also targeting dairy producers, juice processors, and the wider food and beverage market. The bioelectrically enhanced system removes enough contaminants for a brewery or winery to discharge the output into a municipal treatment system without surcharges. For those that want to reuse the treated wastewater, the EcoVolt Reactor can be followed by the company’s EcoVolt MBR (Membrane Bioreactor), a more traditional aerobic system that further polishes the wastewater, removing more than 99 percent of contaminants. This is especially attractive to companies located where water use is restricted. Producers there often face water-use caps that can limit production, and they may also pay high prices for water. “We definitely saw the most interest in California at first, but now we’re seeing interest across the country,” says Claire Aviles, marketing and communications manager at Cambrian. For companies producing less than 15,000 gallons of wastewater per day, there’s also the EcoVolt MINI, which combines EcoVolt Reactor and EcoVolt MBR technology in a single unit. And in late 2015, the company established its WEPA (Water-Energy Purchase Agreement) option, whereby Cambrian installs, owns, and operates its EcoVolt solutions on behalf of an industrial facility, charging a monthly service fee based on wastewater treated and clean water and energy returned to the facility. Having made its first sale in 2014, Cambrian now has industrial-scale projects at more than 10 different wineries and breweries. The company has helped facilities treat more than 70 million gallons of wastewater and recycle more than 20 million gallons to date. It has grown to 40 employees and added a new office in California, in addition to its headquarters in the Boston area. One of Cambrian Innovation’s brewery customers uses two EcoVolt Reactors to transform its wastewater stream into value by generating up to 95 kilowatts of electricity (the average U.S. home consumes two kilowatts of power at any given time). This allows the brewery to eliminate over 4,000 metric tons of carbon dioxide emissions per year through energy savings. Other customers reuse treated wastewater in industrial processes such as rinsing equipment. And those Shewanella microbes that recently traveled to the space station will help determine whether technology like Cambrian’s might commodify waste in space.